Amwell Sports is the official Satellite Group of Amwell Rotary Club. It's members are all full members of Amwell Rotary Club but they hold separate meetings once a month at various locations, including member's homes. They are also welcome to attend the main club meeting each week should they wish. They are an event driven group and completed two major fundraising events in their first year - a 300 mile sponsored cycle ride from Amwell End to Lands End and the Etape d'Amwell, a sponsored Cyclosportive held later in the year. You can find out more about Amwell Sports and their forthcoming events HERE on their dedicated website. 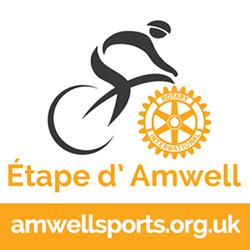 Thank you to all of the riders who took part in the third Etape d'Amwell held on Sunday September 9th 2018. Here are a few photos from the 2017 event. Plans for the 2019 event are well underway. Please check the Amwell Sports website HERE for updates. Back in 2017, a group from Amwell Sports, along with a support vehicle manned by two members of the main club, undertook a sponsored tour of some of the famous Begian Trappist Monasteries. Here are a few photos from the trip.